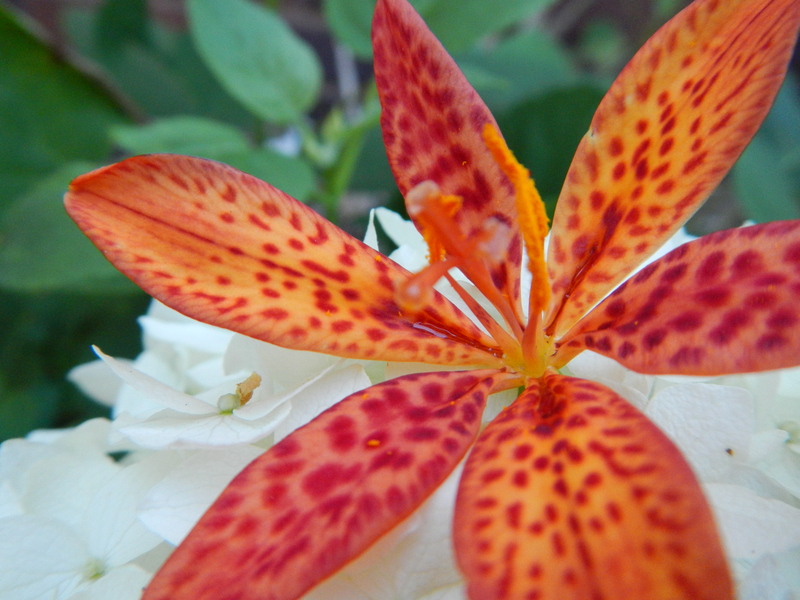 My wild toad lily is blooming! The blade-like foliage and the quirky, orange-red blooms make this one of my favorite plants in the garden. It’s in fairly heavy shade and and it’s not getting quite enough sun. It leans waaaaaay over the sidewalk reaching for those morning rays. So next year I’ll try and find a more dappled location where it’ll be a little happier. I have these in my garden too, but not growing wild; I bought them from a nursery at our local gardenfest. I’m always fascinated by the numerous common names a plant can have, depending upon region. Around here they’re called blackberry lilies, despite not being in the lily family at all! Can you describe (or post a pic) of your entire plant/foliage? I’m wondering if the one in my yard is an exact match, or merely something with a similar flower. Your blog is wonderful! I got here via a “gardening” topic search, hoping to find a few new garden blogs worth following and yours DEFINITELY meets all the criteria! I know I’ll enjoy watching yours through the seasons! These aren’t growing wild but they were, uh, procured from a wild source. It was a dense stand and I took a little cutting and rooted it. It’s taken several years to bloom, but the patience has been worth it. I feel kind of guilty, but I know the wild stand suffered no harm, so I’m trying to forgive myself and enjoy the blooms!